For people with low vision, their sudden inability to continue driving can be the a viscous blow to their independence and quality of life. Driving is more than traveling from point a to point b, it is freedom to do what you like without having to rely on friends and family. Our optometrists have years of experience specializing in low vision with residents of Long Island, NY. As low vision doctors, they have worked with numerous patients to find the right pair of bioptic telescopes, training patients to use them, and watching them gain their independence again. For patients with macular degeneration, age related and juvenile, the loss of central vision can make it extremely difficult and unsafe to drive without bioptics. Call our eye doctor for a free 10 minute consult to find out if you are a candidate for bioptic telescope glasses. The first step in determining if bioptics are right for you is to set up a 10 minute free phone consultation with our eye doctor. Our eye doctor will ask a series of questions to determine if this is the right solution for you. This step is important as our eye doctor wants to help patients find the best solution that will work for their needs. After the consultation, if you have been determined to be eligible for bioptic telescope glasses you will set up an appointment for a full low vision eye exam. During the eye exam our eye doctor will talk with you about your options, the process of training, and the path to getting back on the road. 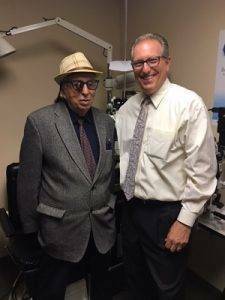 During the low vision eye exam, Dr. Schoenbart will assess your current visual performance, your desired visual performance, and evaluate what kind of telescope lenses will provide a solution for your needs. Our patients feel that bioptic telescopes and the regained independence from driving again, have provided them with a fresh start. Bioptic telescopes are miniature telescopes that are mounted on top of your prescription glasses. They are ideal for driving as they allow you to look through your regular prescription glasses by looking normally, and through the bioptic telescopes by tilting your head down slightly and shifting your eyes upward. They are also ideal for walking, shopping, and going to church where a mixture of close and far vision are required. There is a learning curve when it comes to bioptic telescopes. 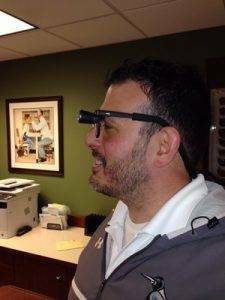 Our low vision practice has helped many patients over the years learn to use bioptics for driving and other tasks. Our feedback from our patients is extremely positive, with many calling their bioptics "life changing". There are many variations of bioptic telescopes, and it is crucial that you have a low vision specialist do a full low vision evaluation to determine the correct bioptics for your visual needs. For a regular licence in the state of NY minimum visual accuity is 20/40 in one eye with corrected vision (Bioptics). For a limited license in the state of NY minimum visual accuity is 20/70 in one eye with corrected vision, and a minimum of 140 degree horizontal visual field. For a limited license with Bioptic telescope glasses a minimum of 20/100 corrected vision in one eye and a minimum of 140 degree horizontal visual field plus 20/40 through the telescope. The DMV requires all drivers wishing to receive a license with a bioptic telescope to have the telescope in their possession for no less than 60 days before beginning the process with them. Training and wearing of the Bioptic telescope for no less than 60 days. Visual acuity through the telescope of no less than 20/40. Visual acuity through the glasses on which the bioptics are fitted of no less than 20/100. Binocular field vision of no less than 140 degrees. Must pass road test if he/she has not taken a road test while wearing his/her telescopic lenses. Limited to class D or DJ driver license only.